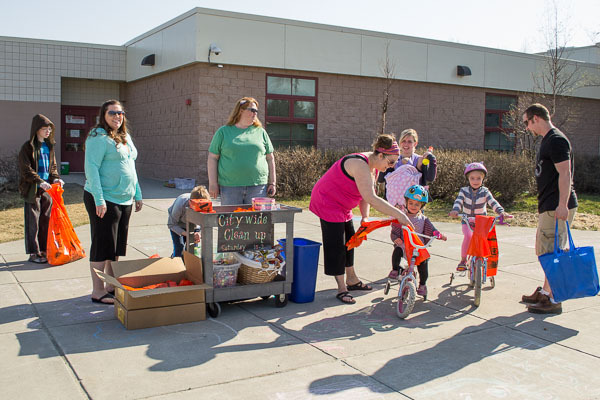 Baxter Elementary School cleans up Muldoon in May 2014. Orange bags for neighborhood cleanup will be available from 10 a.m. – 2 p.m. Saturday, May 2, at Scenic Park Elementary, Baxter Elementary and other participating schools. Trash bags are also available from customer service desks at Fred Meyer stores. All filled bags must be dropped off at any participating school by 2 p.m. Saturday, May 2, for free pickup and disposal. Please do not leave bags after the pick up time. (No yard waste or household trash.) Every student from each school who collects trash is eligible to win an iPod Shuffle™.